Dontech can enhance standard touch screen panels to improve their performance in standard environments, and to allow for proper functioning in extreme environments. Typical enhancements include the addition of antireflective coatings, polarizers, transparent heaters, and EMI/RFI shielding conductive ground planes. For direct sunlight applications, the surface reflections (both internal and external) on the touch panel are controlled through the use of antireflection coatings and polarizers. Problems with low temperatures (e.g., fast transitions from low to high temperatures and proper operation in sustained low temperatures) are overcome with the incorporation of a transparent heater on the rear surface of the touch panel. 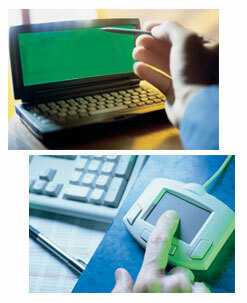 Touch panel ruggedization can be accomplished by optically bonding the touch panel to the front surface of the display. Optical EMI/RFI shielding is accomplished by applying a conductive ground plane to either the front or rear surface of the touch panel. For additional information on optical enhancement technologies, please contact a Dontech applications engineer who can review how these products can be incorporated into a standard touch panel, please contact a Dontech applications engineer, or request that a hard copy of the Windows Design Guide be sent to you.